During a trial, a representative of the Prairie Ridge developer testified that the intent of the covenants was to provide “a very natural, earth-tone environment” that blends in “with the environment.” However, he said that there was no language in the restrictive covenants specifically referencing which paint colors are considered earth tones. 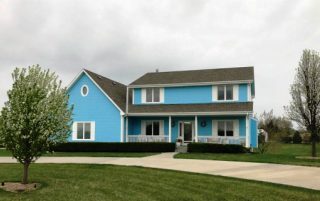 Duane and Kathryn Korth, who live in the Gretna area, were sued by their subdivision’s homeowners association for painting their house blue. But the state’s highest court found Friday that the Korths did not violate the restrictive covenants of the Estates at Prairie Ridge subdivision. Current and former residents of surrounding lots also testified that they had been required to disclose exterior paint color for approval by the developer when building their residences. They all additionally testified that the blue color chosen by the Korths was a nuisance, an annoyance and obnoxious. Thompson ruled in favor of the homeowners association, agreeing that the blue color “clashed with the neighborhood” and “does not fit in.” The exact shade of blue was not disclosed in court documents. The homeowners appealed, which led to Friday’s ruling by the Supreme Court.